The village of Beaumont Hamel was located just behind the German lines in June 1916. The first objective for the British attack here on the 1st of July 1916 was a line just beyond the village. Their third objective was an ambitious further mile and three-quarters beyond that. The German positions commanded the valley which the attacking British troops had to cross on the first day of the Somme battles. The British attack here was undertaken on that day by the 29th Division, part of VIII Corps, and there is a great deal more to see in the nearby Newfoundland Memorial Park, which has another page on this website devoted to it and which can be found to the south-west of the village. The interactive map below shows the sites covered by this page. Leaving Beaumont Hamel westwards on the D163 in the direction of Auchonvillers, this road leads across the 1916 battlefield, crossing first the German and then the British lines. Near the village was the Hawthorn Redoubt, a strong position in the German line, and this was where one of the mines was exploded on the 1st of July 1916. The detonation was famously captured on film by Geoffrey Malins. The crater blown at the Hawthorn Redoubt can still be seen today. The site of this is marked by a clump of bushes and trees on the skyline to the left of the road. A narrow steep track leads to the crater from the left side of the D163 road, before you reach the Argyll & Sutherland Highlanders Memorial. The view from here, over the British positions, shows the advantage the Germans had. Lieutenant-General Hunter-Weston, the Corps commander here, originally wanted to blow the mine four hours before the infantry attack. This was vetoed because the Germans had proved better at occupying mine craters than the British. The mine was blown at 7.20 a.m. – 10 minutes before Zero Hour. The other mines on the 1st of July 1916 were blown at 7.28 a.m. just 2 minutes before the infantry attacked at 7.30 a.m. This meant that the Germans here had good warning of the attack, and they were able to man the front line trenches, often standing in front and firing at the attackers. They also shelled the attackers. Men from the 2/Royal Fusiliers went forward to try to take the Hawthorn Crater. They did reach the crater, but the Germans were on the opposite side, and the Royal Fusiliers also came under fire from German trenches running to either side. Except for about 120 men of the 2/Royal Fusiliers, none of the other 86th Brigade troops (the other attacking battalions were the 1/Lancashire Fusiliers, 1/Royal Dublin Fusiliers and the 16/Middlesex) reached the German held positions here, and the attack failed. The original crater was later the site of a second mine, this time on the 13th of November 1916, the day a successful attack took the village. The first mine (1st of July) used just over 40,000 lbs of ammonal; the second 30,000 lbs. So this is actually a double crater, although it is very difficult to see much at all, as the crater is lined with trees and the undergrowth is thick. Just a little further along the D163 on the right hand side is a large memorial and a British war cemetery. The large and imposing memorial is to the 8th Battalion Argyll & Sutherland Highlanders, and is in the form of a massive Celtic Cross. The site for the memorial is located very near to where the Battalion HQ was in 1916. The French landowner gave the land on nominal terms and on Sunday the 4th of March 1923, the memorial was unveiled by the Duke of Argyll. An officer and 20 other ranks from the battalion, plus French representatives including the Mayor of Beaumont Hamel, attended the ceremony, at which pipers played. The memorial stands 27 feet high, with eight panels around the base, four larger ones on each cardinal face plus a smaller one at each corner. 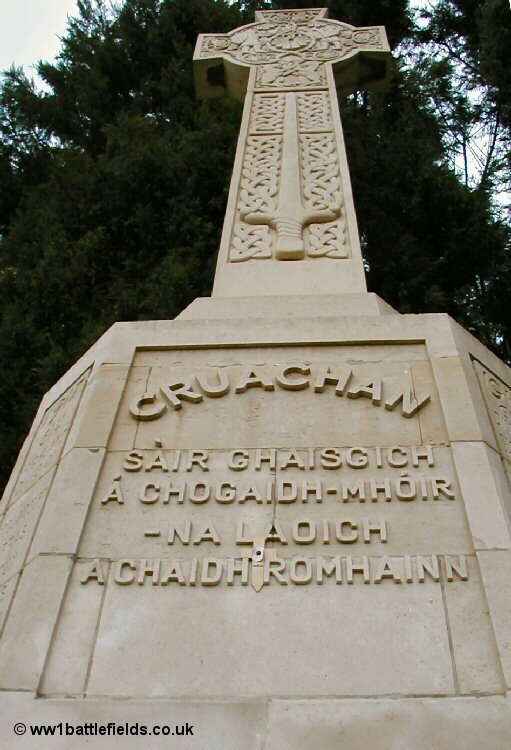 The front panel has an inscription in Gaelic, shown in the right hand photo above. On the 13th of November 1916, the 8th Argyll & Sutherland Highlanders were part of the 51st (Highland) Division, and they attacked from a position slightly ahead of that of the 1st of July. The second mine in the Hawthorn Crater was blown, this time just before Zero Hour. The leading troops here met with strong German resistance, but took the village. 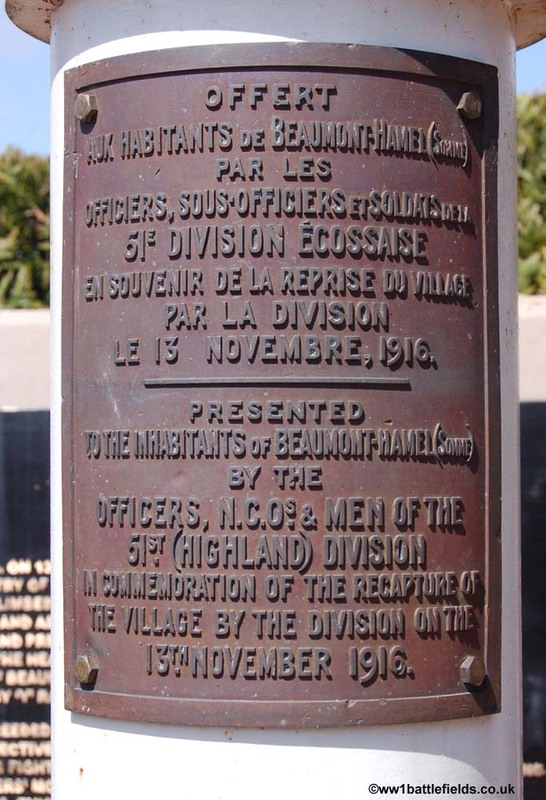 In Beaumont Hamel village, at the bottom of the Rue de la Montagne, stands a flagpole commemorating the capture of the village by the 51st Highland Division on the 13th of November 1916. 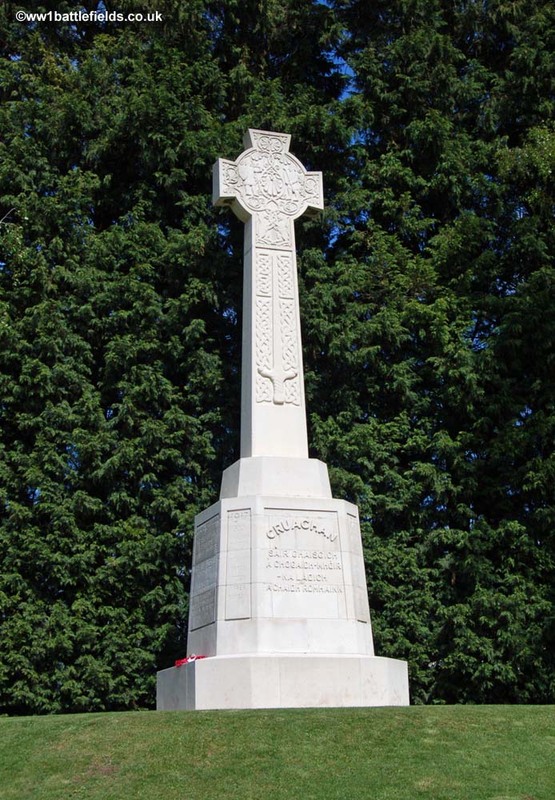 The flagpole was restored following an appeal launched by the Scottish Branch of the Western Front Association. Generous donations were made by many people, including £1,000 from a WFA member whose uncle was killed on the 13th of November 1916. 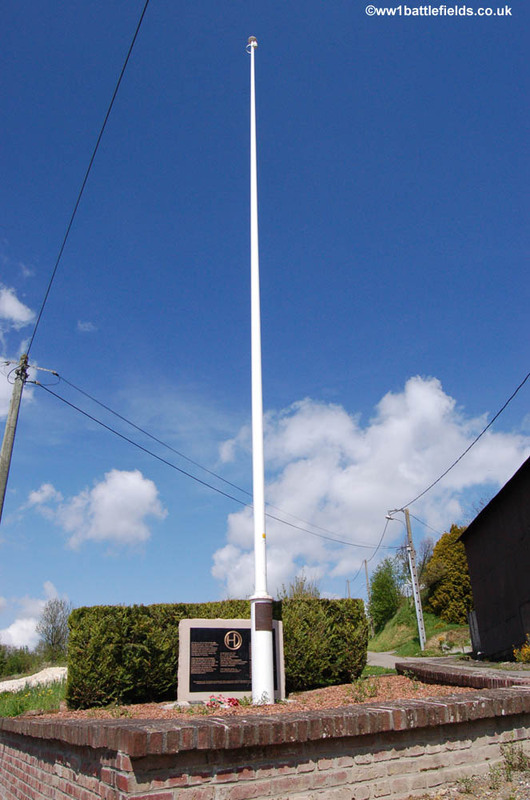 The replacement flagpole was unveiled at Beaumont Hamel on the 90th Anniversary of the battle – the 13th of November 2006. There is a plaque with more information standing behind the flagpole. 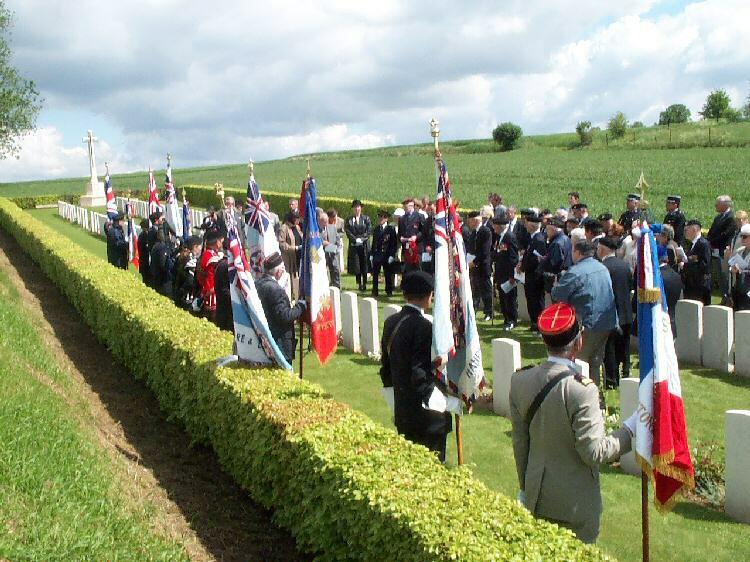 A grass track directly opposite the memorial leads to Beaumont Hamel British Cemetery. Standing at the gate of the cemetery, and looking back towards the road you can see the tree-lined Hawthorn ridge mine crater on the ridge behind the road. Beaumont Hamel British Cemetery standing in what was No Mans Land, and was started after the village was taken on the 13th of November 1916. It was used until February 1917, and more graves were moved here after the Armistice. 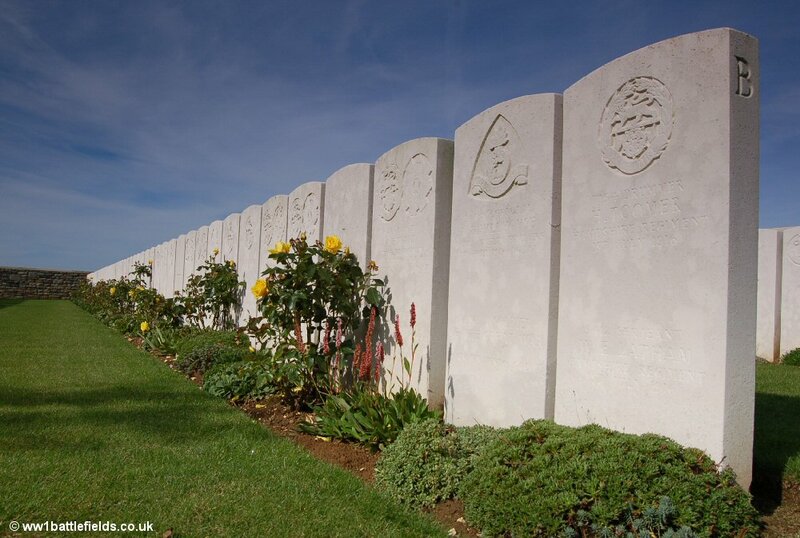 It now contains 97 identified and 82 unidentified burials from the Great War, in two long rows of graves. Many of the burials are 1st of July casualties. 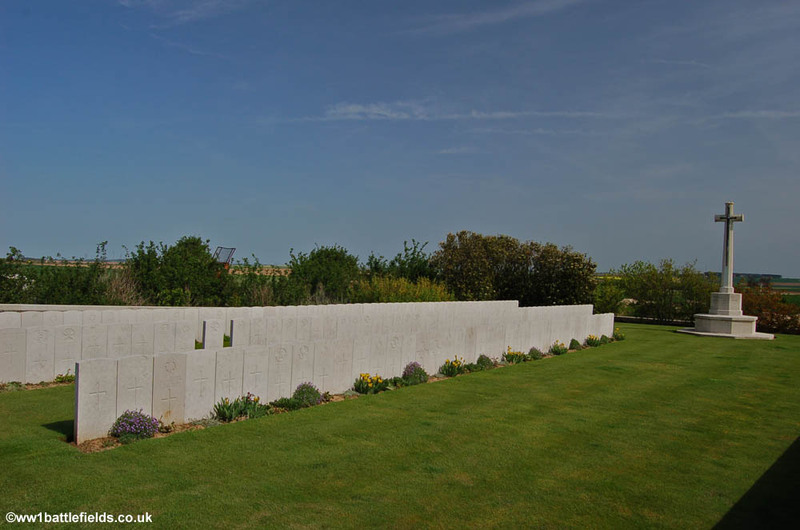 There are two special memorials to men known to be buried here, which are located directly behind the Cross of Sacrifice at the back of the cemetery. 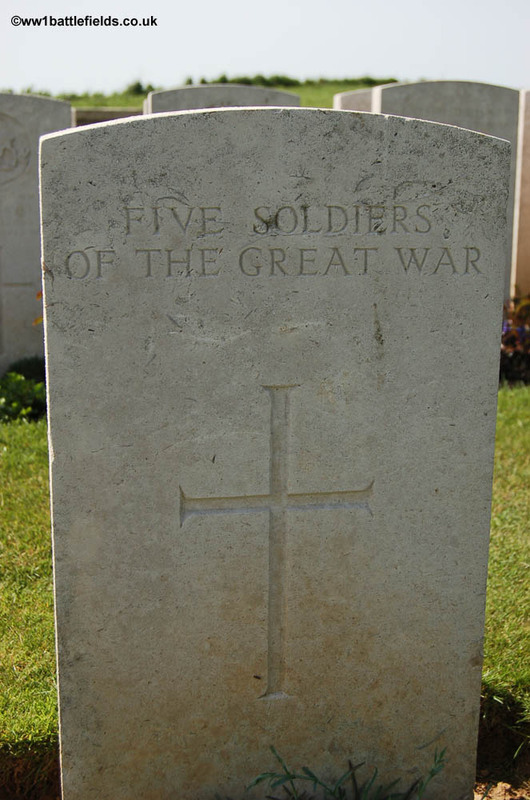 After the war, it was decided that the headstones of the fallen would be of a common design, and one of the few areas of choice for the next of kin was the religious emblem. Usually, this was a cross, although families could request this be omitted, or for other religions another appropriate symbol be in its place – such as the Star of David. The Star of David can be seen on the grave of Private Harry Steinberg, buried here, but until 2005 his grave showed a cross. Western Front Association member Andy Green was the man behind this change. On a tour of the Somme Battlefields, he noticed that Private Steinberg’s grave bore the cross, although his name suggested he may have been Jewish. On returning home, Andy found that Harry Steinberg was listed in the British Jewry Book of Honour. The 1901 Census enabled Andy to trace the Steinberg family, and he located Private Steinberg’s obituary in the Jewish Chronicle. When Andy presented all this evidence, the Commonwealth War Graves Commission agreed to change Harry Steinberg’s headstone. Andy, along with Geoff Spring (Chairman of the Ox. & Bucks Branch of the WFA) attended the rededication ceremony on May the 9th 2005, after the new headstone bearing the Star of David had been put in place. 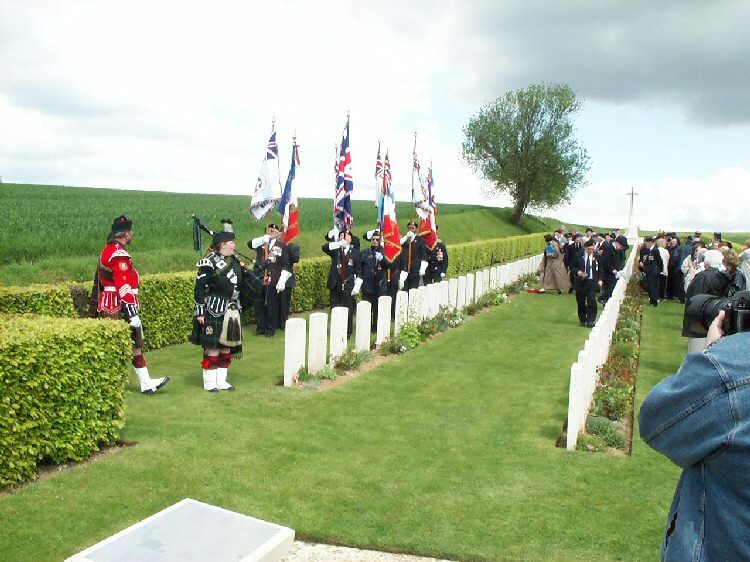 About 60 people were present at the ceremony, including local dignitaries, the military (including a Jewish French General), members of the WFA, members of the Association of Jewish Ex-Servicemen and Women (AJEX) Standard bearers, a bugler and a pipe player. On one visit, someone had placed a photo beside the grave of Private John W Ridings, a 1st of July casualty. The photo had an inset of him in soldier’s uniform, but the main picture was obviously of his family when he was young – three children sitting around their mother, with innocent faces looking gravely towards the camera. 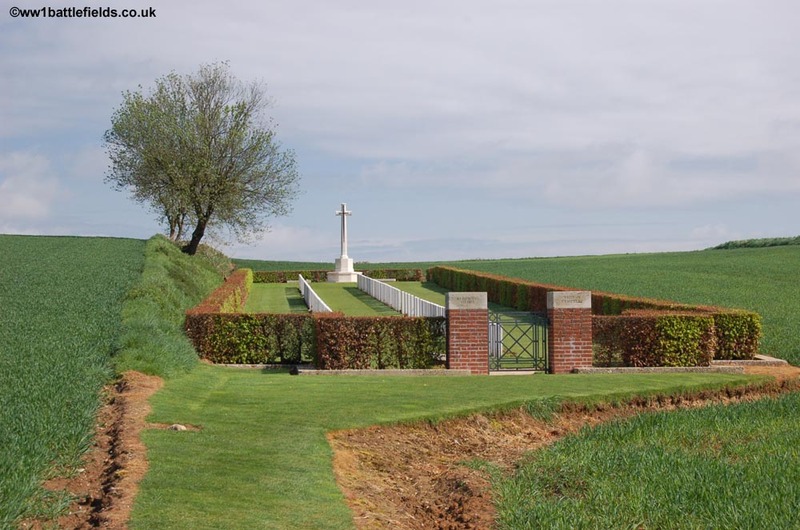 In between the Argyll & Sutherland Highlanders Memorial and Beaumont Hamel Cemetery is a track running up the hill. This is the Sunken Lane, from which British troops attacked the German lines (which were to the right as you look directly up the lane) on the 1st of July. Private John Ridings may have been one of those who died in the attack launched from this lane; he was with the 1st Lancashire Fusiliers who attacked here that day. A little further along the D163 road from Beaumont Hamel to Auchonvillers, on the right, is the position where Geoffrey Malins famously filmed the mine explosion on Hawthorn Ridge on the 1st of July 1916. A small road (the Rue de la Montagne, where the 51st Division flagpole can be found) leads north from Beaumont Hamel up to Redan Ridge. This is an area of higher ground, where the 4th Division attacked on the 1st of July 1916 and suffered disastrous losses. Some soldiers did reach the German front line, and a few even reached the German support line, but so few that they were surrounded and killed or captured, with only two returning. However, there were some gains made here in the later attacks in November 1916. There are a three cemeteries in this area, all named after the ridge. Redan Ridge No. 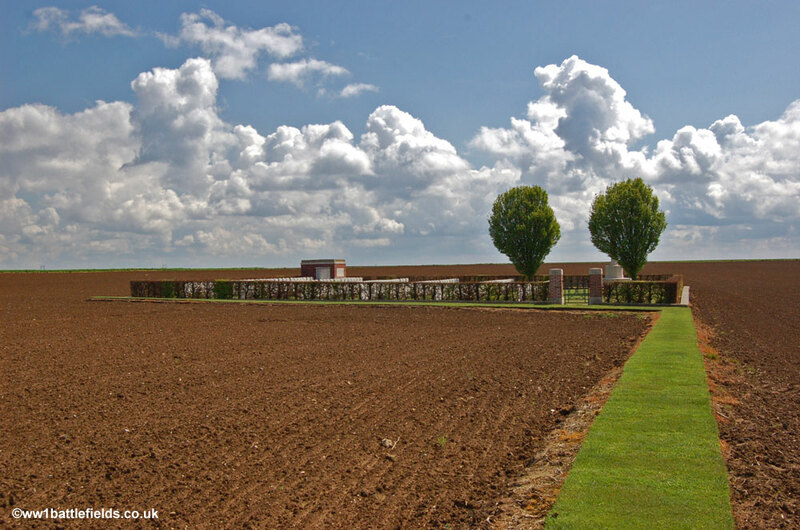 2 Cemetery, the largest of the three, is located off a rough track heading off to the left, opposite farm buildings. This track is not really negotiable by car, so it is best to walk to the cemetery. 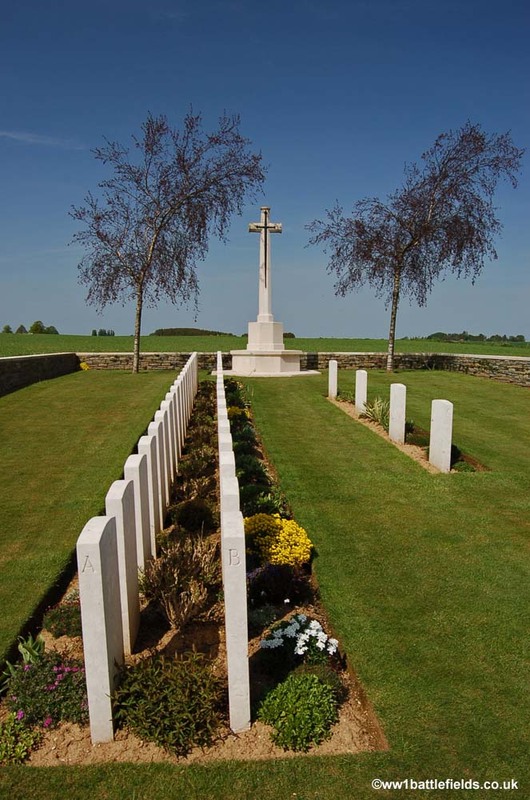 The cemetery has just three long rows of graves here, with a triangular apex where the Cross of Sacrifice is located. There are over 250 graves here, and almost all the headstones have two or more names, often with two different badges engraved to represent the different regiments. 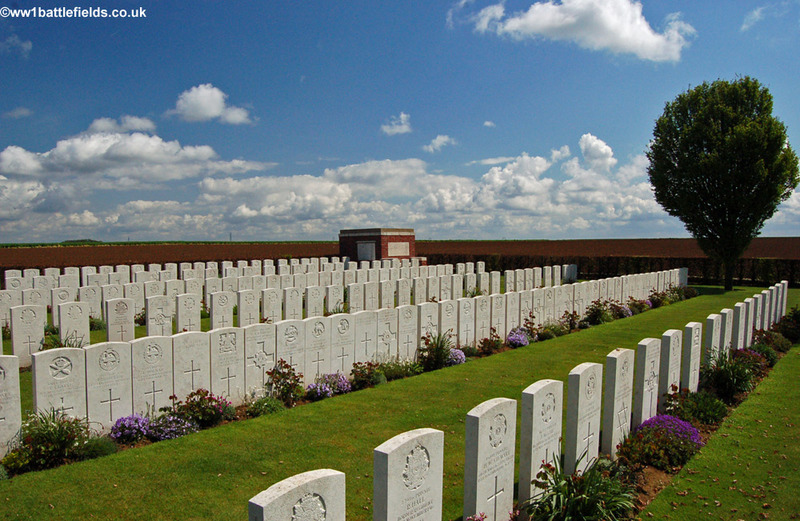 Just over 150 of those buried here are identified, and the cemetery was made by V Corps in the spring of 1917. Like others in the area, it is located in what was No Mans Land during the summer of 1916. Returning along the track to the road, and continuing north, another small track leads off to the left to Redan Ridge No. 1 and No. 3 Cemeteries. There is a calvary where the track leads off. The first cemetery, Redan Ridge No. 3, is visible from the road. This is a small cemetery, with just three rows of graves. Rows A and B at the back are complete rows, with the headstones close together, whereas row C contains only four more spaced out headstones – see left hand photo below. The last two headstones in Row C however commemorate seven and five unknown soldiers respectively. 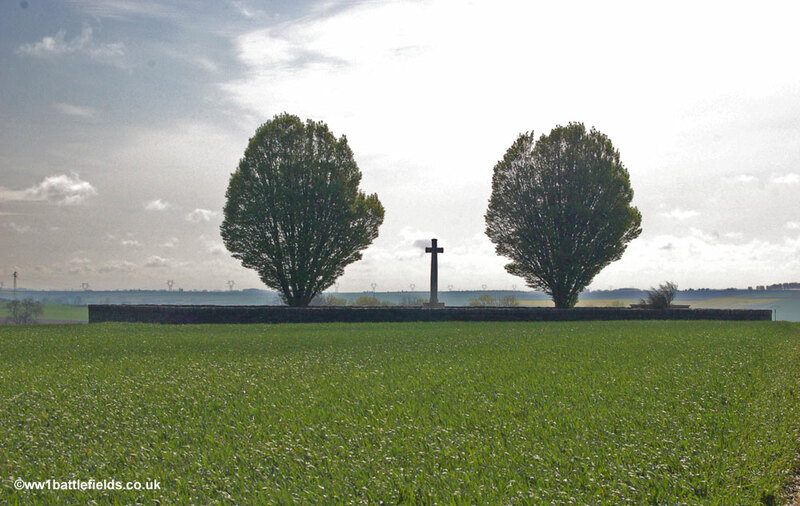 The cemetery is located just behind the position of the 1916 German front line trenches. To the left and right of the entrance are thirteen special memorials to men known to be buried here. Their graves were destroyed later by shellfire. With one exception, the known burials here date from mid-November 1916, many from the 13th November when there were successful attacks near here. There is one grave from the 1st of July: L/Cpl F. Purdue of the Hampshire Regiment. 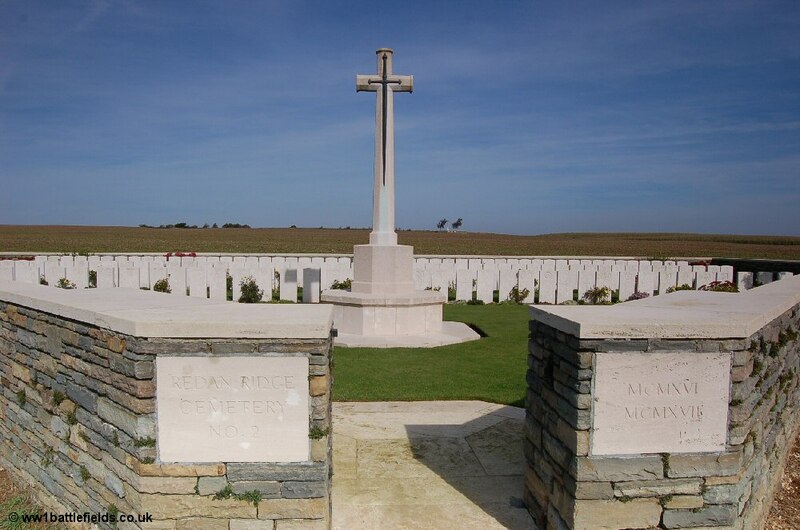 It is possible to see another five cemeteries from Redan Ridge No. 3. Standing at the gate of the cemetery, you can see another straight ahead. Looking left, at almost 90 degrees, across a field, a second Cross of Sacrifice is visible, with a third a little more to the left and further away. If you then walk to the back of the cemetery, the top of Serre Road No. 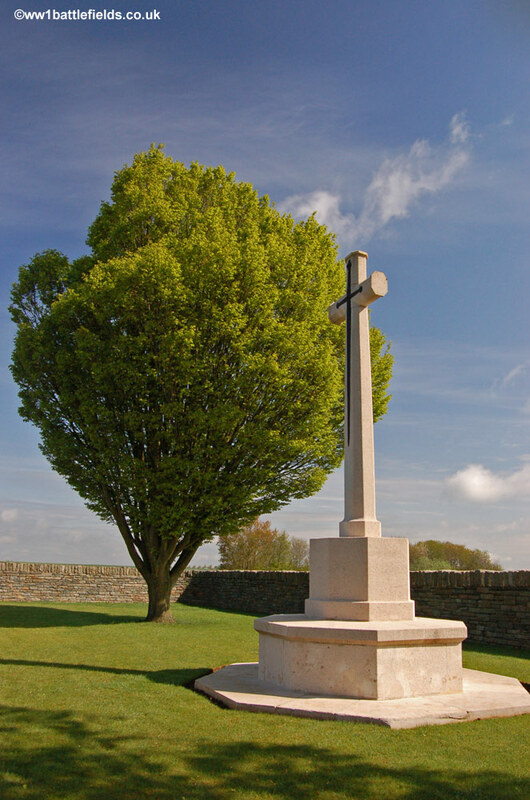 2 Cross of Sacrifice is visible, and to the left is Redan Ridge No. 1 Cemetery. Continuing further along the track, this crosses the position of the German front line trenches in 1916, and on into No Mans Land. Leading off to the left is a beautifully maintained grass path which leads to Redan Ridge No. 1 Cemetery. This cemetery is located in what was No Mans Land. 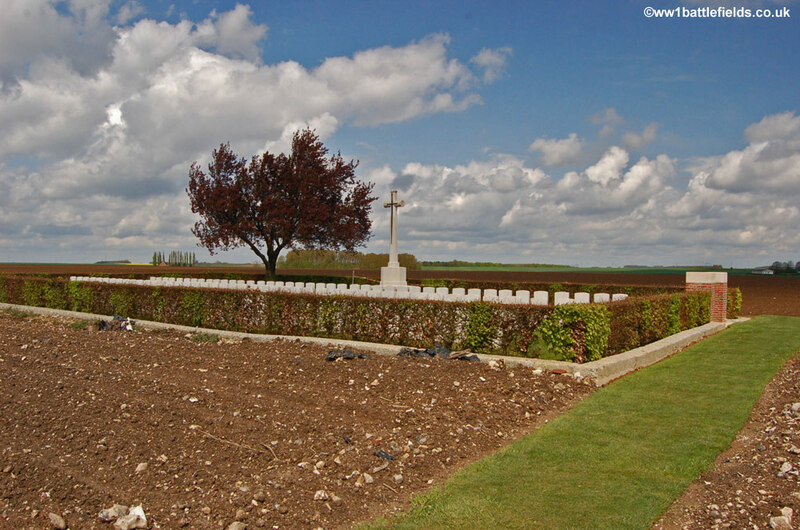 Many of the burials date from the November attack here, although there are also a fair number from the 1st of July. The graves are grouped in three long rows with the headstones so close together they are touching. Overall, there are just over 150 burials here, nearly half of which are unidentified. 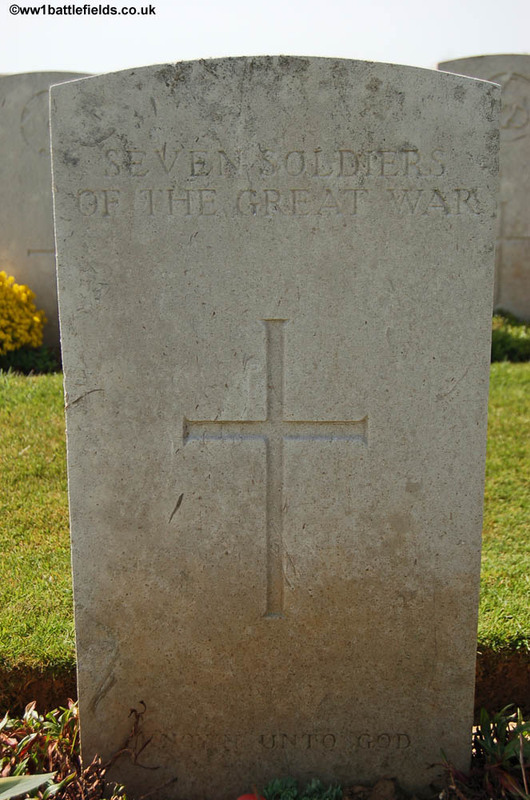 On the headstone of Second Lieutenant Henry Davies of the Oxford and Buckinghamshire Light Infantry is the inscription ‘A friend of children: he died that the children of today may have peace tomorrow‘. 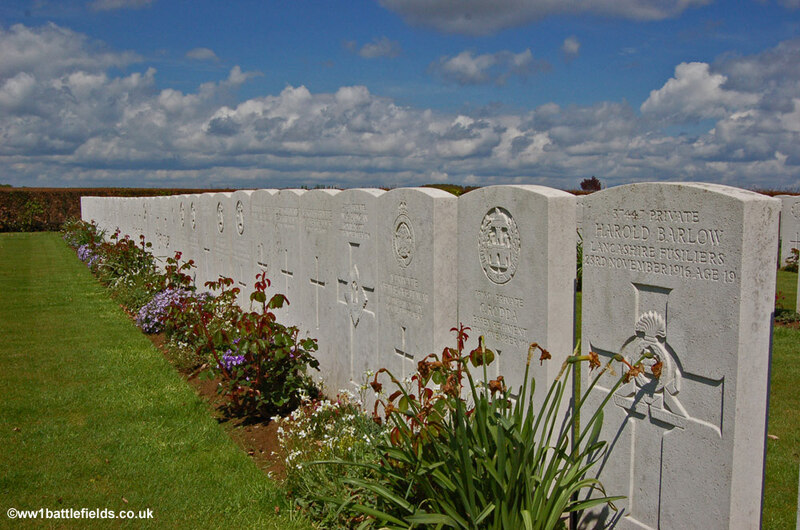 Private George Johnston was just 18 when he was killed in action on the 27th of November 1916. His mother, Margaret Johnston of Bilbo Cottage in Port Erroll, Aberdeenshire chose this inscription for his headstone: ‘Your glorious work is over dear son. Rest in Peace. From his Mother‘. The inscription on Nicholas Nicholson’s headstone is much shorter: ‘God’s finger touched him and he slept‘. 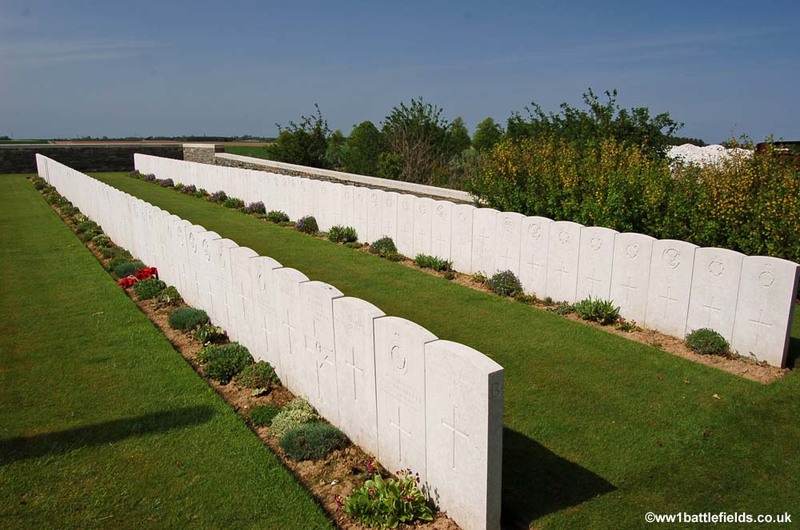 There are a number of other cemeteries in the area around Beaumont Hamel. Located not far from the Hawthorn ridge mine crater described earlier is Hawthorn Ridge No. 1 Cemetery. This is reached by a track from the D73 between Auchonvillers and the Newfoundland Memorial Park. There are superb views down into the valley from the track, looking along the British lines, and the memorial to the Argyll & Sutherland Highlanders and Beaumont Hamel Cemetery can be seen. 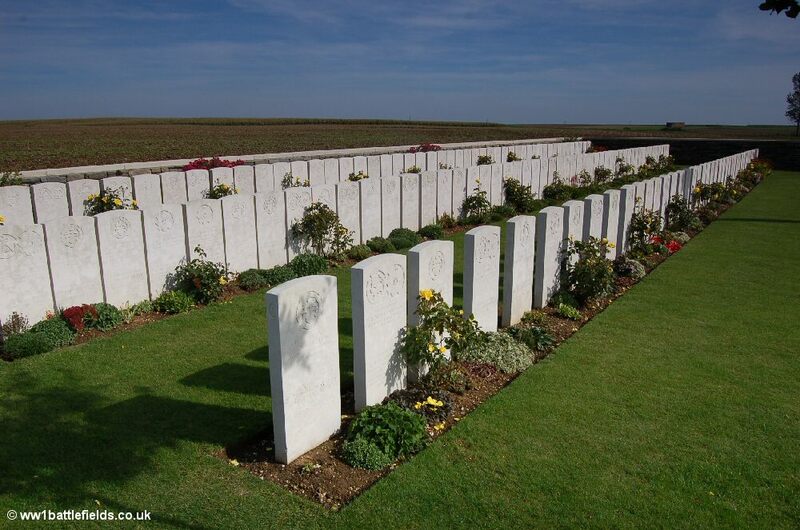 Just where the small path leads off the track to reach the cemetery is where the British front line was located. 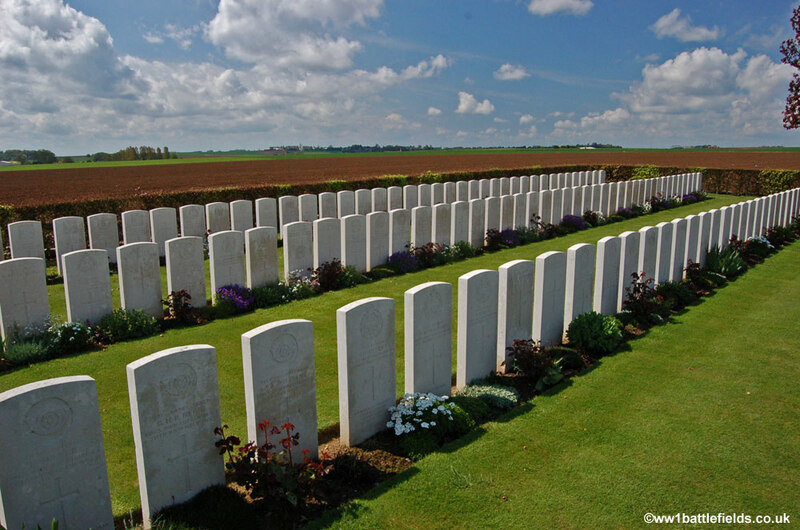 The cemetery itself is in what was No Mans Land in 1916. It is very small, with just two rows of graves and was another of the cemeteries made in spring 1917 by V Corps. It was originally designated ‘V Corps Cemetery No. 9’. 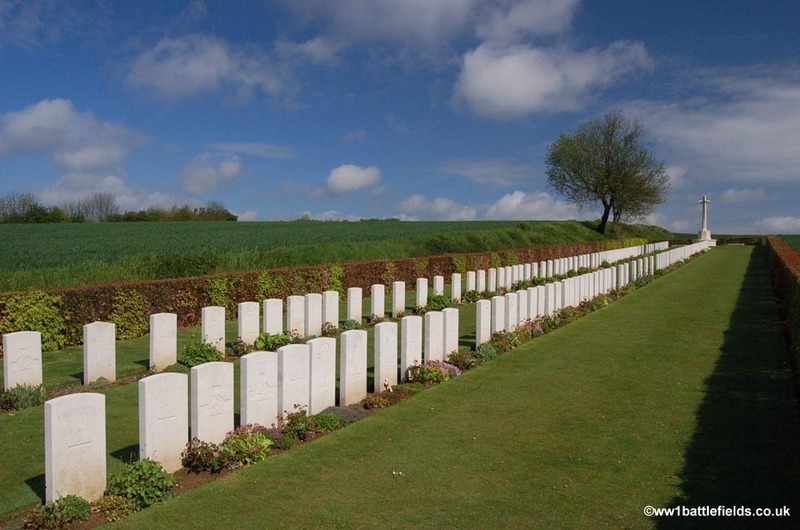 There are just over 150 men buried here, only 82 of whom are identified. Buried here is Second Lieutenant Heaton, and like many others here his is one of two names shown on a headstone. 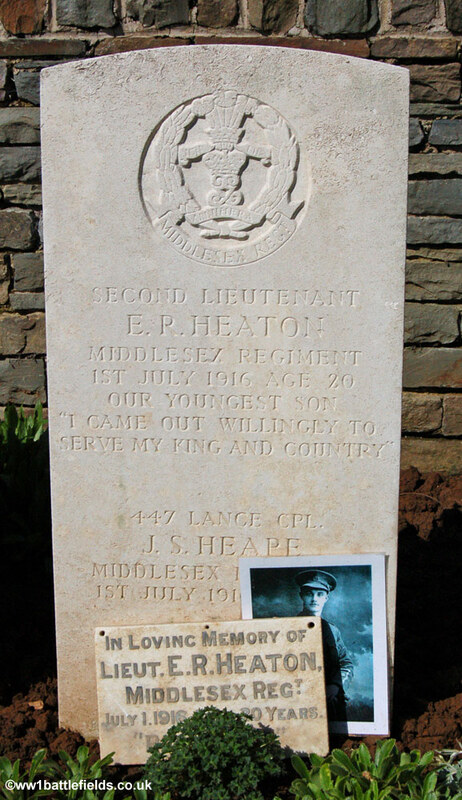 Eric Heaton, the youngest son of Reverend and Mrs Heaton of Hove, was just 20 when he died on the 1st of July, and a small plaque was later placed by his grave which is still there today. Also named on the same headstone is Lance Corporal John Schofield Heape from Bedford, who was the same age and died on the same day. In fact, the majority of the graves here are of men who died on the 1st of July, although there are also a few from late June 1916 and also from the 13th of November when the village of Beaumont Hamel was taken. From the crossroads in the centre of Beaumont Hamel village, a small road leads off to the north-east. 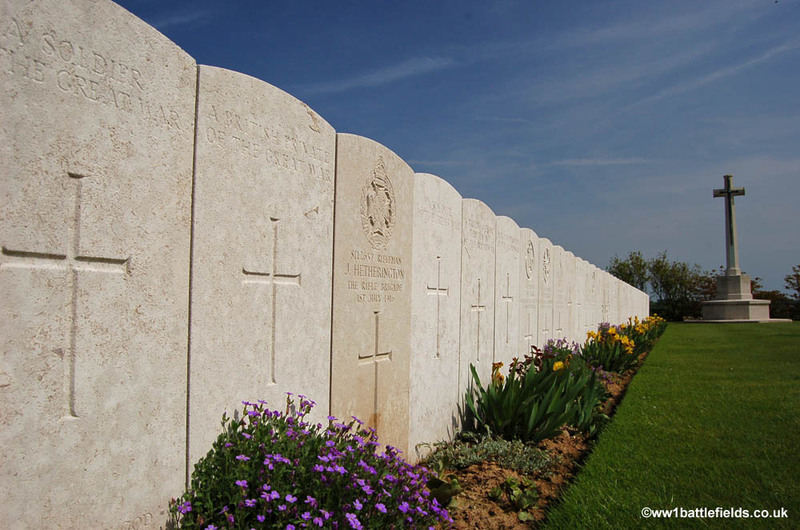 There are green CWGC signs for two cemeteries: Waggon Road and Munich Trench Cemeteries. The narrow road leading uphill to them has open fields to the left and a grassy bank to the right. This road was known as Waggon Road during the war. SHortly after the bank on the right ends, Waggon Road Cemetery is located along a grass path to the right of the road. This was originally known as V Corps Cemetery No. 10 (and this name is inscribed on the cemetery gate post). The cemetery is quite small, with 195 soldiers buried here in six rows, although the headstones are not evenly spaced. Of these, 36 are unidentified, and 46 belong to the 11th Border Regiment which was in action near here in both July and November 1916. On the headstone of an unknown soldier here is the wording: “A British Private of the Great War, Name unknown” rather than the usual “Known Unto God”. Following the narrow road a little further along the road, it becomes a track, and off to the left is Munich Trench British Cemetery. The more usual name was taken from the Munich Trench which was captured by the 7th Division on the 11th of January 1917. 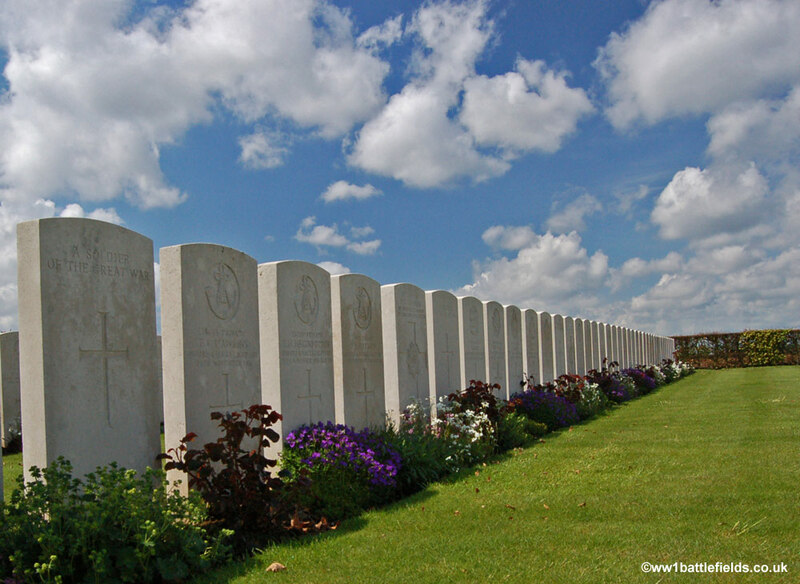 Munich trench crossed the road near the cemetery and ran parallel to the track as it ran north-east towards Serre. Like Wagon Road, this too was made by V Corps in Spring 1917, and was also known as V Corps Cemetery No. 8.There are 126 soldiers buried here, 26 of whom are unknown. 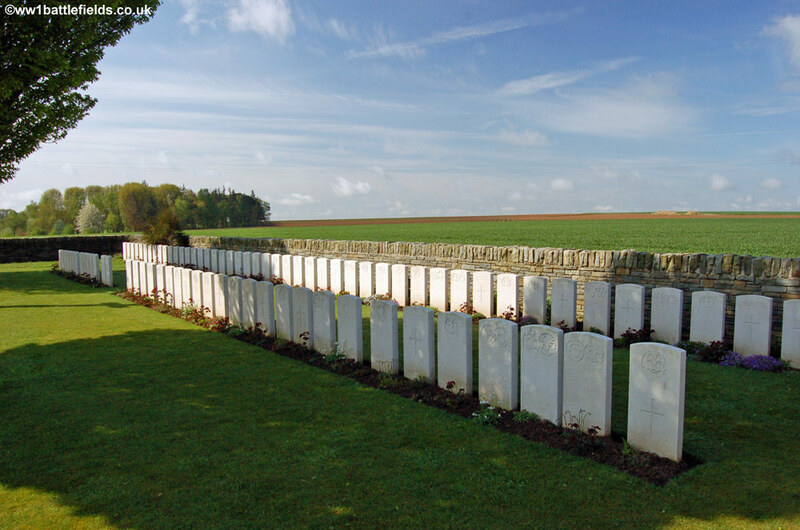 Just to the west of the cemetery in the fields is where Hector Hugo Monro was killed on the 14th of November 1916. Munro was better known under his pen-name of ‘Saki’, and has no known grave; he is commemorated on the Thiepval Memorial.